turkey, how to roast one? I never roasted a turkey before last week. Thanksgiving and Christmas are the only times during the year that we eat a roasted turkey. And, the only time we had Christmas dinner at our house (we usually eat at the Big House or my parents’ house), my cousin’s husband – a wonderful cook – took over the turkey cooking part, to my relief. For all other holiday meals, someone else was in charge of the turkey – someone with many years of experience cooking turkeys. Some years I think it is a shame that I have not learned to cook a turkey, like it is some right of passage I’ve missed, but usually I am happy that someone else has that intimidating and important job. But, the other day I went into the farm store and saw they had fresh, pasture-raised turkeys – for a fairly good price. A 15 pound turkey can feed our family for a long time, I though. I bought one. And, I roasted it the next day. So, now I’ve cooked my first turkey and have done so without the fan fare and pressure of a holiday meal. To start with, though, I did what everyone does when they don’t know how to do something and want to find out – I went to the Internet. I looked up recipes and read that you should truss the turkey, stuff it with aromatics, and rub the outside of the turkey with butter. My trussing technique was pitiful. I used embroidery floss to tie the legs together (I couldn’t find kitchen twine, if we even have any). And, I used broken skewers to try and secure the wings to the body, but it did not work and the turkey just looked like it was impaled with small wooden arrows. I also mixed together butter with salt and pepper and some spices and herbs to rub on the turkey. But, I am not sure how anyone can rub butter over a slightly cold, slightly damp raw turkey. The butter clumped up despite my best efforts to spread it, and I decided to leave the clumps and let them melt over the turkey as it started to roast, hoping that would be fine. I roasted it on a higher temperature for a short amount of time, then turned the oven down a bit lower than the recipe suggested. Since I had to be out all afternoon picking up children and running errands, the turkey was going to stay in the oven for longer than the recipe recommended and therefore would also not be basted every 20-30 minutes as was also suggested. Despite the novice approach, the turkey was delicious. There are not any pictures of the finished turkey, since I must have been too busy, but it was not much to look at. Quite brown and not even as good looking as the raw bird (though it was more appetizing). We’ve had sliced turkey, turkey soup, turkey mole, turkey enchiladas, and gallons of turkey stock and pints of sliced turkey in the freezer. I will definitely do this again, perhaps improving upon my turkey cooking techniques. 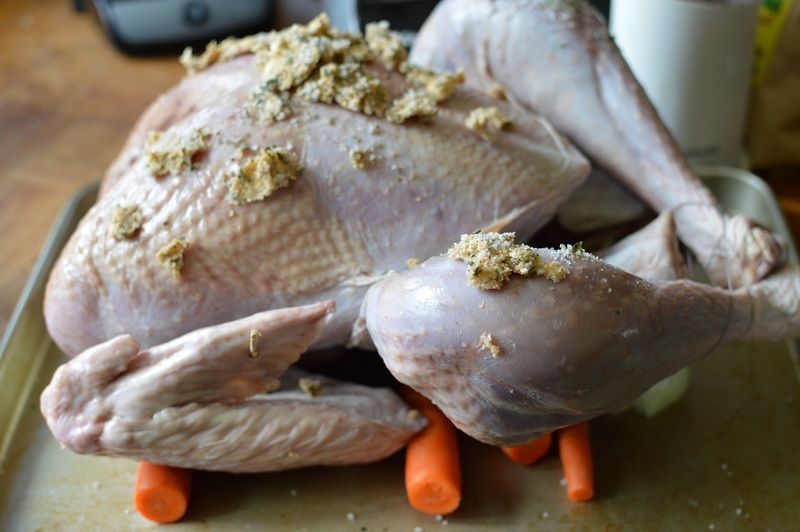 Take the turkey out of the refrigerator about an hour before cooking it (assuming it is fully thawed). Rinse and pat dry with paper towels. Mix butter with salt and pepper and any chopped herbs or spices you want (smoked paprika, thyme, sage, and rosemary are good). Set turkey in a roasting pan on top of a rack. Or, if you don’t have a turkey roasting pan, like me, put it on top of 4-5 long carrots and a few halved onions so it is off the bottom of the pan. Put a few herbs sprigs (thyme, rosemary, sage) and halved carrots and onions in the cavity of the turkey. You could also do a half of a lemon or garlic cloves or celery. 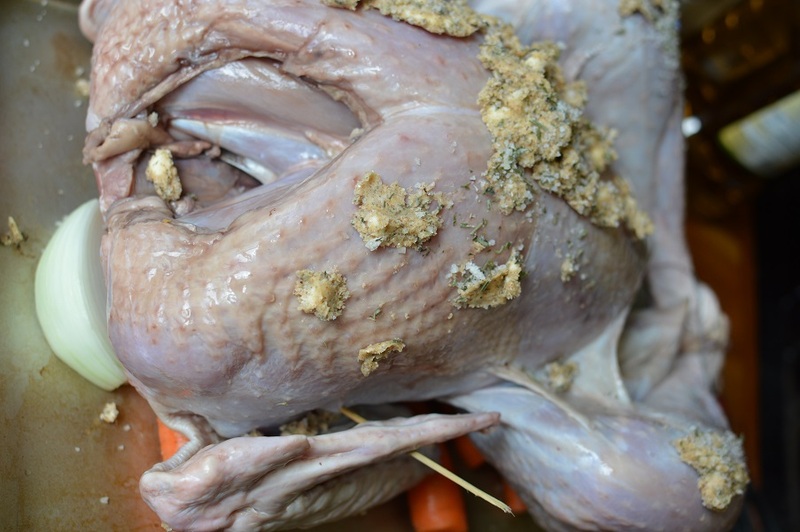 Rub the butter on the skin of the turkey – or just clump it on top so when it melts it will spread over the turkey. Roast at 425 degrees for about 40 minutes. Then, turn it down to 325 and cook for about 2.5 more hours. You can use a thermometer stuck in the thickest part of the thigh to see if it is cooked well enough. Or, you can pick up your son from preschool, run errands, pick up your older kids from school, take them to their lessons, and when you get home, take out your slightly over cooked (you won’t need a thermometer – it is definitely done) turkey. Cover it with aluminum foil. Keep it under the foil tent for about 1 hour (or more, if you need it to finish helping your children with homework and getting the rest of dinner done). Then, carve as best you can. I know – how did I get so far along in life and never cook a turkey!? Thanks! Your turkey was very forgiving. Yes! I am not sure if it was all the butter, or that it was so fresh (or pasture-raised – the turkeys here are consistently good), or luck.